A rear view or backup camera designed for vehicles is an innovative device developed using the most recent technology as a means of keeping everyone in a car or vehicle safe. If you are an RV owner then it is necessary to think about having the best RV backup camera installed in your vehicle. Aside from the fact that it is required by the federal government to fit every car with the camera, the RV backup camera installation is also necessary for your safety. Note that all drivers encounter problems when they reverse their vehicle, park it, or check what is behind them. Problems might also arise when viewing cars surrounding you. If you want to make these tasks easier to handle, then you have to install the high quality RV backup camera system. It is an essential tool as it supplies you with all the information that you need regarding everything that surrounds you. It is also essential in keeping you focused. Just make sure that you get the most reliable and high-quality one by reading highly informative and legitimate RV rear view camera reviews. Check such reviews so you will know which camera has all the characteristics you need. 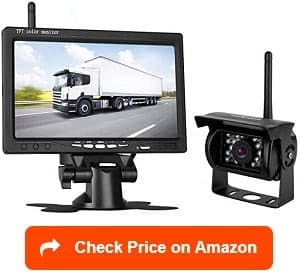 You may also consult the short reviews here that can help you find a good backup camera for your vehicle that can help improve your safety on the road, protect you from accidents, and improve your driving skills. 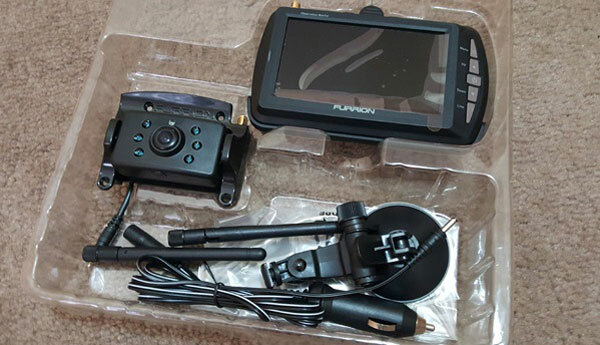 You might also want to consider getting the Furrion 7291125 vehicle observation system if you are looking for a dependable backup camera for your recreational vehicle. I think one of its strongest features is the 4.3-inch anti-glare monitor. It displays things clearly while also having a smart IR cut filter, thereby providing a full spectrum and clear image. The anti-glare monitor also works effectively in making automatic adjustments for the contrast, brightness, and color whether you drive during daytime or nighttime. I am also impressed with the ability of this system to give you peace of mind while traveling. It even lets you travel comfortably with its numerous unique features and capabilities. It also features a security camera auto-wake, which is a big help as it turns on automatically and shows an image each time the monitor senses movements. The versatility of this unit is also undeniable. It is versatile as you can use it over a doorway if you want to get more security or at the back of your RV in case you need a rearview assistance. The infrared night vision feature also makes it possible for you to use it even at night. It is also waterproof with an IP65 rating, ensuring that it offers protection from constant exposure to not only water but also other outdoor elements. The camera is also a big advantage as it is designed to transmit a wide and clear image using the 1-way audio starting from the part in the view of the camera to the indoor monitor. Installing it is also easy. One problem, though, is that some users find its screen too small. Despite that, it can still deliver clear images, which is a good thing. I can also say that this digital wireless backup camera from DohonesBest works well for recreational vehicles. I am glad to say that this backup camera is designed in such a way that it works without any interference. You can expect its wireless signal to retain its clarity and smoothness regardless of your speed when driving your RV. It even comes with an external antenna, which you can use in further strengthening the signal. It also features a camera, which is IP69K waterproof. You can easily hook it up or install it without worrying about the bad weather affecting its performance or ruining its overall design and feature. I am also happy that this backup camera is fog-resistant. In addition, it takes pride in its night vision capability. Another thing that is so good about this unit is its versatility. It is versatile as you can use it in various applications, not only in RVs. You may install it in cars, SUVs, vans, fifth trailers, campers, trucks, and motorhomes, too. It also showcases colored and HD screen pictures. With that, you have an assurance of the unit’s clarity. You can also easily set it up to work in reverse. It also boasts of its three different mounts, making it possible for you to hook the monitor in a fixed part of your RV or in the windshield or dashboard. It has a minor fault, though, and that is the antenna, which is a bit loose even if you tighten it. Rear View Safety RVS-770613 can be considered as a single wired backup camera specifically designed for recreational vehicles. I am glad that it boasts of a 7-inch digital screen, which also takes pride in its 130-degree viewing angle. I am also happy to say that this rear view camera is capable of handling a max of three cameras. That’s a good thing if you wish to expand this backup camera system in the future. Another satisfying benefit of this system is that it features a trailer disconnect cord, which you can use in case you wish to do a 5th wheel or travel trailer installation. Another benefit of this wired camera is that it prevents you from worrying too much about the picture being cut out because of issues with the wireless transmission. Another nice feature in this system is its 18 infrared lights. With such lights, you have the chance of seeing clearly up to a max of 50 feet even in full darkness. Such proves its effective night vision capabilities. I am also pleased to say that this system is completely waterproof. Such waterproof nature makes it effective in handling all kinds of weather. Furthermore, the monitor used in this backup camera is capable of displaying distance grid lines. With such ability, it is possible for the monitor to provide you with enough reference regarding the amount of room left behind you. However, one drawback associated with the use of this camera is that its one-time installation is slightly time-consuming. 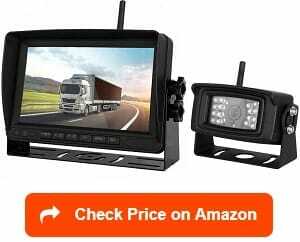 I also suggest checking out the wireless backup camera & 7-inch monitor kit from LeeKooLuu. I am glad that this wireless module features a 7-inch display and camera. They are already built in so rest assured that you only need to hook the power supply and antennas into them. One impressive benefit of this kit is it is capable of transporting video signals automatically. You can set it to rear view in case you want to reverse only. You can also set it to full-time view in case you wish to drive, park, or reverse. Another function of the wireless backup camera is that it lessens blind spots. It gives you the chance to park and reverse properly without depending completely on side mirrors alone. The camera is also waterproof, which means that it can handle even the harshest conditions. It can combat the bad weather while being easy to hook up. You will even enjoy its fog-resistant nature. In addition, it takes pride in its 7-inch LCD widescreen monitor, which also has a built-in wireless receiver. Such monitor shows clear and high-quality pictures. It also boasts of its excellent wireless signal range that can go over 150 feet. The DC power of this backup camera is also designed to handle large trailers, buses, 5th wheels, box trucks, and semi-trailers. It boasts of a good driving versatility, too, with the help of its two video inputs. One issue in this kit, though, is that the mounting bracket for its display unit is not that easy to get tight to hold in a single position. 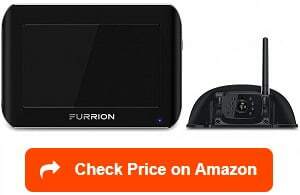 Another Furrion RV backup camera that should be included in this list of the best products is the Furrion FOS48TA-BL. It makes use of digital wireless technology, making it a really excellent buy. I noticed that it works for specialty and recreational vehicles up to a range of a hundred feet. One great benefit of the backup camera is that it works in getting rid of interference from the exterior environment. It also comes with a powerful infrared camera with wide-angle lens. Such camera locks in a digital manner into a wide LCD color display. It is also beneficial with its ability to deliver a seamless video transfer. I am happy to say that the LCD color display included in this camera is wide enough as it runs at around 4.3 inches. It is also multifunctional and features an external antenna. I am pretty sure that most users will also be impressed with the camera’s upgraded CPU, which also boasts of its signal stabilization that runs up to five times. This camera is also designed to handle vibration. It even underwent extensive tests to check its ability to resist vibrations. I am also pleased to say that it is climate-smart designed. With such design, I am sure of its ability to handle even the most extreme climates. One possible issue associated with the use of this backup camera, though, is the fact that it does not include the mounting bracket on its price yet. This means that you might have to make a separate purchase for it. Another excellent choice, if you are searching for an RV backup camera, is this digital camera offered by 4Ucam. I am totally impressed with this digital wireless camera. I noticed that it is completely versatile as it works well not only for RVs but also for trucks, 5th wheels, motorhomes, trailers, and buses. This digital wireless camera is known for being in the commercial grade category, which offers an assurance that it is indeed high in terms of quality. The 7-inch monitor is also enough to give you a clear view in case you are backing, reversing, or parking. Since it uses the digital technology, I am also sure that it has zero statics and interference while also having a hundred percent clear picture quality. The LCD widescreen also has a built-in digital wireless receiver. It is easy to use and set up because you just need to plug the screen into a cigarette lighter plug. This means that there is no need for you to use additional wirings and wireless receivers. It also boasts of an LCD, which is around an inch thin, sitting on a base that is completely adjustable. It lets you target the screen in all directions. One more thing that I am so glad about is that it comes with a removable external antenna specifically designed for the monitor. With such antenna, you will constantly receive an excellent reception in case of long-range signals. There is a wireless signal bar, too, which provides relevant details and information regarding signal strength. Some of its users complained about the fact that the process of mounting the camera is a bit time-consuming and tiresome, though, which is one of the product’s flaws. This is another RV backup camera that you should never fail to incorporate into your list of choices. 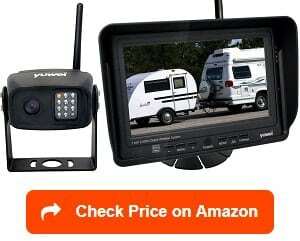 I highly recommend this RV backup camera, especially if you want to back, park, or reverse your RV or trailer safely and confidently. It is mainly because this camera is capable of providing a decent quality of images. It is waterproof, which means that it is resistant to the rain and other elements. The camera also boasts of its 18 infrared lights. Such lights allow the camera to work with night vision capability. The extension cord is around 50 feet in length, which is just the right length if you want to experience utmost convenience when using it. Another great benefit of this backup camera is that it features a monitor, which will turn to AV2 automatically, indicating the reversing video. I am also pleased with the easy mounting process of this rear backup camera. You are also allowed to mount it in several ways. I am also happy to say that you can make adjustments on the monitor’s video feed in several ways. You can flip and rotate it. Each time you set it up based on your preferred adjustment, you can expect that setting to be in default when you turn the camera on, making it convenient to use. Another advantage of this product is that it is capable of hooking up two cameras. One drawback, though, is that it does not have installation directions and wiring diagrams, so those who are still unsure of how to set up this type of camera may experience difficulties in doing so. 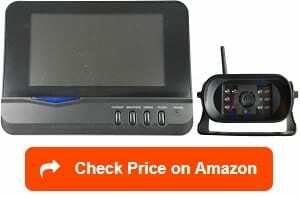 Another RV backup camera that you should consider using is this digital and wireless kit from ZEROXCLUB. It is an excellent backup camera, which works without causing any interference. I am pleased to say that such ability to operate without any interference allows it to provide a smooth and clear wireless signal. You can even expect such kind of signal to be delivered even on vehicles that have up to 75-mile speeds. This wireless rearview camera is also made using highly advanced technology. It is equipped with 18 infrared lights as well as a CMOS sensor, both of which are helpful especially when you are parking or reversing at night. I am pleased with this system’s ability to deliver superior night vision capabilities – that’s all thanks to its digital and high-definition image processor. It is made in a way that it can withstand harsh elements, too. That is made possible with its IP69 waterproof feature. Another impressive benefit of this RV backup camera is that it lets you reverse or park in a safe and confident manner. The whole installation process is easy and fast, too. In fact, it will most likely take only a little over two minutes. Moreover, you will be pleased to know that the monitor can turn on automatically. It is also capable of switching to rearview cam automatically in case you are reversing. As for the drawback, one flaw that you might encounter is the fact that the included directions/instructions are quite unclear and vague. 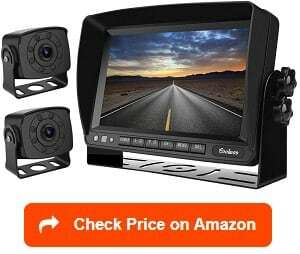 If you are in search of a wired RV backup camera & monitor kit then I highly suggest this specific product from CoolWoo. I am glad to say that this camera and monitor kit is completely versatile. Such versatility is proven by the kit’s ability to work compatibly with different kinds of vehicles, including RVs, vans, and semi-trucks. One benefit that is worth mentioning when you buy this dual backup camera is that it is superbly high in definition. It even features an infrared night vision camera, as well as a 6-layer filter glass, featuring the most recent CCD chips. The kit is also guaranteed to show its users colorful and sharp image displays. With the eight infrared LED lights integrated into the kit, I am pretty sure that its night vision ability will be totally bright. This makes it much more convenient and safer for you to park and reverse. I am also impressed with the premium quality of this RV backup camera. It is waterproof, so expect it to function and operate superbly even during violent storms and heavy rains. It also eliminates the worries associated with the mist or fog penetrating within in case it gets flooded with water. The HD screen of this backup camera is also large. Equipped with a DVD support and two video inputs, this large screen will surely let you enjoy a superb HD experience. However, one common complaint among users is about the size of the wire supplying power. Some complained that it is a bit thin, affecting its durability. Another digital and wireless RV backup camera that you can choose is this reliable kit offered by Yuwei. The fact that this RV backup camera system features a DIY design specifically means that you can install it on your own. I am even glad to say that you can do the installation process in less than an hour. This will definitely save a lot of your time and effort. It comes with a 7-inch wireless monitor, which displays sharp and clear images. Such monitor is made in a way that you can set it up in just one minute. You can even install it by just simply connecting it to DC12V-32. 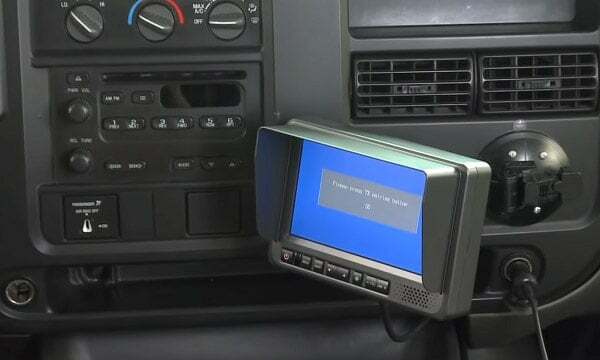 With its upgraded digital and wireless design, I am pretty sure that this RV backup camera can also operate without any additional wiring and interference. The fact that it is wireless also means that it operates normally even when you use it on vehicles that are around 150 feet. I can also say that it is capable of letting users enjoy a more stable transmission of the signal. Expect it to deliver a clear and smooth signal even during those instances when you change the speed of your vehicle in a fast manner. Moreover, it has the ability to support up to four wireless backup cameras. You can also view each added camera separately or individually, which promotes utmost convenience. One flaw, though, is that it is heavier in comparison to other cameras. Still, you have an assurance that the weight still does not reach that point wherein it is already difficult to manage. Trying to find the best RV backup camera will also most likely cause you to come across several Tadibrothers wireless RV backup camera reviews. Such reviews might point you to the brand’s 7-inch monitor, which comes with a mounted and wireless RV backup camera. It boasts of its 7-inch LCD monitor, which is guaranteed to show a crystal clear display. With that, I can safely say that it is indeed one of the best products that an RV driver needs in case he needs some assistance when reversing and backing up. I am also glad about the camera’s ability to show rich colors. Another advantage is that the built-in LCD monitor is both thin and lightweight, making it easier to mount and manage. It is versatile since you will instantly notice its compatibility with different cars and vehicles. It is also capable of connecting to any source of power, including a cigarette lighter. Another nice benefit of this backup camera is its superbly easy installation process. It is totally waterproof while boasting of its auto night vision. It is also constructed to be very durable. In addition, it takes pride in its excellent night vision clarity as well as its adjustability. You will also surely enjoy its ability to offer protection from pebbles and glare – thanks to the camera’s metal sun shield visor. As for the drawback, one thing that you might instantly notice is its higher price tag when compared to the others. 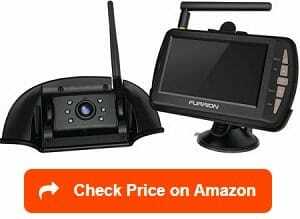 One ideal option for the best wireless backup camera for RV is the Furion FOS48TAPK-BL wireless observation system. 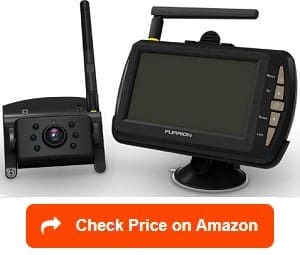 I think that this Furrion RV backup camera is designed in such a way that it can check behind your RV while lessening the risk of blind spots. What is beneficial about this system is that it utilizes digital transmission in sending images to full color. The range of display is also wide – from 4.3-inch up to a hundred feet. It also takes pride in its improved CPU, which works in streaming high-quality videos at a high speed. It also takes pride in its simple setup process. The simple setup can be attributed to the fact that the camera is designed in such a way that it is built into the transmitter. I am also glad that this system is capable of keeping the GPS running and operating even when you are dealing with extreme climates. The infrared LED lights integrated into this camera also make it possible to enjoy night vision even during those low-light situations. One more impressive thing about this backup camera is the fact that it promotes a high level of reliability – thanks to its IP66 duct-proof and waterproof nature. Moreover, there is a guarantee that it can provide you with an excellent picture quality with the aid of its CMOS sensor. However, it has a drawback, which is its inability to support audio. Whether you are searching for a wireless RV rear view camera or just the standard one, it pays to consider these factors to boost your chances of making a wise purchase. Video quality – Of course, you want to make sure that you are getting a rear view camera with a high level of video quality. This will prevent a nuisance when it comes to viewing the things you want to see on the road. With a good quality video, you have an assurance that there will be less fuzzy pictures. You do not also need to tire your eyes viewing black and white visuals. Better video quality means that you can clearly see all the things that go behind your vehicle. Aside from giving backup assistance, it also lets you see clearly whether your vehicle’s tires are flat, if there is an animal, which interferes when you are backing up, and if you are blowing smoke. When it comes to determining the quality of the video, remind yourself that the wireless transmitters, cables, and screen have a say on it. Types – When searching for the best backup camera for RV, it is necessary to be fully aware of all your options. In the case of recreational vehicles and large trucks, be aware that you have two primary options – the standalone backup camera and the camera with a dedicated screen. The majority of modern recreational vehicles actually feature a GPS navigator on their dash. With that said, it is not a good idea to buy a camera, which comes with a screen or monitor if your dash comes with a screen already. In this case, it would be best to buy a standalone camera – one, which you can connect to a screen with an HDMI connector. However, if your RV’s dash is not equipped with a compatible screen then it is advisable to check packages that already have screen systems and cameras. You can also choose to purchase a Wi-Fi-based camera, which you can directly connect to the screen of your smartphone using a dedicated application. Such is beneficial because it is hassle-free and requires only minimal wiring. It does not also cause issues during the installation. Field of view – The field of view of an RV backup camera is also extremely important as it contributes a lot to the width of its viewing angle. In most cases, backing up or reversing your RV requires you to have a wider field of view to guarantee ease and your own safety. In this case, look for a backup camera designed for recreational vehicles that can provide a minimum of 90-degree field of view. You can also go for wider views and bigger sensors as you can find them on the market today. If you want a better-performing backup camera, then go for models with a 120-degree field of view. Mounting options – It is also necessary to look for an RV backup camera with the specific mounting option that is compatible with what you need. Some of your options are the surface mounted, the flush mounted, and the license mounted. The most popular choice is the surface mounted, which lets you mount the camera on a flat surface found at the rear of your vehicle. The ideal choice is to mount your backup camera up high. This will give you an excellent view while giving you a more decent depth perception. Another mounting option is the flush-mounted. This is a good choice if you prefer a device, which is more discreet and sleeker. It lets you keep the camera inside, allowing it to peep through a hole, which you have to drill into the RV’s body. What you will see from the outside are the camera lens and the bezel only. One benefit of the flush-mounted camera is that it is less exposed to harsh elements and the weather. The problem is that it is not possible for you to mount this type of camera too high on your vehicle. Lastly, there is the license-mounted RV backup camera. With this camera, drilling holes or making modifications to the exterior of your vehicle is no longer necessary. You only need the hole of your vehicle’s license plate to mount the camera with ease. While it is convenient, take note that the positioning is also limited to the exact location of your license plate. In most cases, you will get a view, which is close to the surface of the road. Weather resistance – Another vital factor to consider when it comes to searching for a good wired or wireless backup camera for travel trailer and RV is its ability to resist the harsh weather outdoors. The weather-resistant nature of the backup camera is essential, especially if your vehicle often experiences various outdoor conditions for a long period. If the body of the backup camera and its connectors are not designed in such a way that they can handle the harsh effects of the snow, rain, heat, and dust, it will most likely need replacement soon. Constant replacements will only cause you to spend more than necessary. Ensure that your chosen camera is weatherproof or weather-resistant so it will last for a prolonged period. Night vision – If possible, look for an RV backup camera with a night vision. Remember that you will not only park your vehicle in broad daylight. You can use this feature during those instances when you need to back up your RV safely in dusk, dawn, night, or darkness. With the night vision capability of the camera, you have an assurance that you will be able to see clearly when parking. The majority of backup cameras also utilize infrared LEDs, thereby offering visibility even during those situations when you are dealing with pitch-black darkness. Auto-power on – You can find this feature in most high-end backup camera models. This feature is extremely useful in connecting to your RV’s reverse light. With that, you can expect the camera to go online automatically each time you reverse your vehicle. It also provides live feed automatically every time you need it. This is an added convenience to RV owners so if possible, look for this feature in a backup camera prior to buying. What is an RV Backup Camera? An RV backup camera is a helpful device that can be installed in any recreational vehicle. It is the perfect solution when it comes to dealing with the challenges associated with reverse driving. You will also find the backup camera useful in case you get stuck on a busy street or along a narrow road. Also called rearview or reversing camera, this special kind of video camera is specifically designed to be attached to the rear of your RV, so you will receive immediate help in backing up. It is also helpful in alleviating rear blind spot. Another of the major function of this camera is to prevent a backup collision. Note that the specific areas that are directly behind vehicles are known as killing zones. You can minimize your risk of dealing with danger on the road once you connect this camera to your RV. With the help of the camera, you can easily maneuver your vehicle out of the mentioned situations. It can provide you with a live video feed that you can constantly access directly from the driver’s seat. The majority of the vehicles today already come with this camera. However, older models do not have this device. If yours does not come with the backup camera yet then it is best to invest in one. With the RV backup camera around, driving in reverse and preventing yourself from backing into obstacles that might be in a blind spot will be easier. It is also a big help when it comes to preventing or minimizing the risk of possible accidents, including knocking down kids who might be at your vehicle’s rear end or in your driveway. Generally, the backup camera shows its ability to improve your safety. Aside from offering protection on a driveway, it can also keep you safe each time you drive in a highway. How Does an RV Backup Camera Work? Your RV backup camera can be expected to work based on your chosen installation option. Note that there are actually two installation options for the camera. The first one is by wiring it into a reversing light. This option makes the backup camera helpful each time you need to reverse. Another option is wiring it to a constant source of power. If you choose this option, then you can expect your RV backup camera to be extremely helpful during reversing modes and each time you drive on a highway. It can keep you safe in both scenarios. For the RV backup camera to work, it should also have its key qualities. These include enabled night vision, wide field of view, and interference protection (vital for the wireless cameras). The camera’s viewing angle’s width serves as its field of view. With a wide field of view, you can expect the device to work in providing you with a clear and great view of the specific spot behind your vehicle’s rear bumper. If possible, pick only those that have a field of view of at least 90 degrees. In case you decide to go for the wireless backup camera then you have to spend time scrutinizing its level of interference. If you are getting the analog signal then note that it is prone to interference. If possible, go for the digital signal if you do not want anything to interfere with the way it functions. Also, take note that the main design of the RV backup camera is totally different from the other types. It is because the image of the backup camera is flipped horizontally as a means of producing a mirror image output. This specific design is necessary since the driver and the camera are facing in opposite directions. With a mirrored image, the camera can produce a consistent orientation of the display. It also often makes use of the fisheye or wide-angle lens. Such a lens makes the camera work in viewing a horizontal path without any interruption. You can also point the camera downwards if you want to see any potential hazards or obstacles on the ground. It also works in seeing the actual position of any approaching docks and walls. Box Camera – This is one of the most popular styles or types of RV backup camera available today. 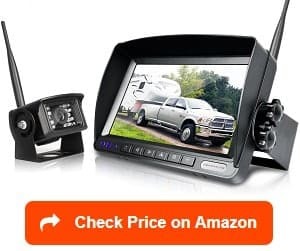 This backup camera is one that you can easily mount in your RV, trailer, 5th wheel, and farm or construction equipment, among many other possible applications. It has the standard 120-degree field of vision as well as other useful features including the adjustable sunshade and U-bracket for mounting, automatic night vision LED lights and waterproof housing. Your options also include other features, like the high-resolution CCD lenses as well as the grid lines that make it possible for you to determine the distance of the things that are behind you. Some of the models of this device also come with a double camera, making it possible for you to use one camera in viewing the trailer hitch and the other in viewing down the road. 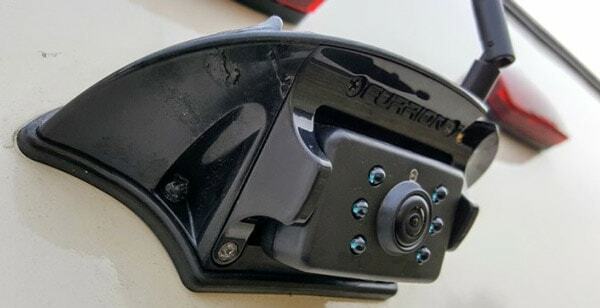 License Plate Camera – This camera is designed in such a way that you can mount it over your vehicle’s rear license plate. It works in almost all applications, not only in RVs. You can expect it to be compatible for use with trucks, cars, trailers, and campers, among many others too. It functions in all vehicles that have US-sized license plates. One thing that you have to take note of about this type of backup camera is that it features automatic night vision LED lights that are extremely useful during low-light conditions. You can also find a low-profile variety of this backup camera, which you can use in those states that do not allow anything to cover the license plate. This camera also features grid lines, making it possible for you to judge the specific distance of certain objects that are behind you. Other things that you can see in the license plate camera are hi-res CCD lenses and the black or silver exterior finish. You will also most likely see a full-frame version with this camera being attached to the license frame. Bumper Camera – This type has a compact design and manufactured in such a way that you can mount it to the bumper. Most modern trucks, cars, and RVs already feature a small and removable piece where you can mount this device. Side View Camera – This is ideal for huge vehicles that have large blind spots or limited visibility. Some examples of these vehicles are semi-trucks, campers, and recreational vehicles. What’s good about having this type of camera installed in a large vehicle is that it makes the process of changing your lanes on the highway safer. 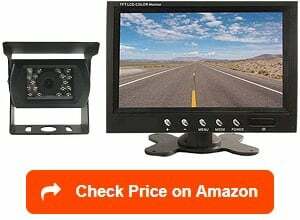 It is a good choice as it lets you see all the things surrounding your vehicle no matter what direction you are going. It does such function with the help of the split screen monitor as well as the front-facing and the rearview camera. Dashboard camera – The dash cam has also become a popular option for those who drive for commercial purposes and those who commute several miles on a daily or regular basis. If unfortunately, you experienced an accident, the dash cam serves as a conclusive evidence that shows the exact scenario. With that, you can lower your risk of dealing with costly legal hassles linked to theft/vandalism, insurance fraud, or road rage. It records footage on an SD card. You can also monitor it remotely using your tablet or smartphone. Surface-mounted camera – This is a device, which you can mount on a flat surface. In most cases, you can mount it high up. Such positioning is beneficial as it provides you with an excellent depth perception and a commanding view. This makes it an extremely good choice for large vehicles, like RVs. Flush-mounted camera – What is good about this camera is that you can mount it through a hole in your vehicle’s body. It offers a clean look because the only visible parts are the bezel and lens. However, take note that this camera is positioned in such a way that it levels the road. With that, you can’t expect it to give the same depth guaranteed by the surface-mounted camera. 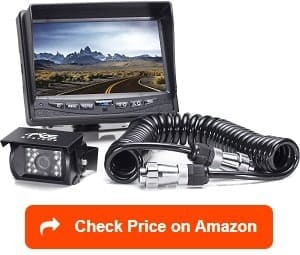 Wired camera – One of the major advantages of the wired backup camera system designed for recreational vehicles is that it provides the most impressive quality as well as the most stable images. The only problem with this wired camera is that it is more difficult to install when you compare it to the wireless backup camera system. Still, it is a perfect choice if your recreational vehicle is metal-skinned. Wireless backup camera – As the name suggests, this backup camera designed for RVs utilizes wireless technology to work. It is the easiest to install. However, it also has a drawback, which is the fact that it is more prone to interference that might trigger the loss of signal. This is the main reason why you have to check it regularly if you decide to install it in your RV to determine any level of interference. Promotes ease in parking – By installing a backup camera in your recreational vehicle, parking will be much easier for you. Note that several states do not need parallel parking skills when you are trying to get a driver’s license. With that, there is a possibility that you will encounter challenges getting in and out of spots with street-side parking. Also, no matter how professional you are in parallel parking, you may still experience problems especially if the vehicle ahead of you or behind you leaves, causing a new one to slide closer. This might cause you to only have less room for you to maneuver your vehicle. With the help of the backup cameras, the mentioned parking nightmares can be prevented. They can help you park conveniently without the risk of backing into or grazing another vehicle during the process. Helps you save money – A backup camera installed in RVs can help you prevent minor scratches and bumps, which can also lead to fewer insurance claims and subsequently lower premiums. Also, several car insurance providers offer discounts for those who have car safety equipment around, such as a backup camera. In addition, the camera also serves as an irrefutable evidence in case of an accident wherein you are not at fault. You just have to modify or set the camera so it will be able to record. This will let you save money since you will not have to pay for expenses related to the incident. Reduces the risk of you backing up over someone – Another great advantage of the camera is that it lowers your risk of backing over someone, particularly a child or pet. Note that large vehicles and SUVs that do not have a built-in backup camera has a 20-feet blind spot. By installing the camera, you can instantly solve the problem. It also works in eliminating blind spots. If you look behind you, the mirrors will only send alerts to the things that are behind your vehicle. The blind spots produced by this scenario might cause animals or people to get in the way of your vehicle when you are backing up. The camera can get rid of blind spots while letting you see those things that are difficult to see otherwise. Easy to install – As an aftermarket device, you will never have a difficult time installing it or setting it up. In most cases, the whole process just requires mounting a small camera on the back bumper then placing a dashboard screen. The whole installation also takes only the least amount of time. Aside from the already mentioned benefits, you will also eventually realize that the camera provides an ergonomically friendly solution to drive. Note that if you reverse normally then it might involve you turning in your seat and craning your neck as a means of seeing the things behind you. This might cause a lot of discomforts. With the help of a backup camera, you can always face forward and ensure that your hands stay firmly on the wheels. This can keep you safe at all times. Where to mount your RV backup camera? This is dependent on the mounting option of the backup camera that you have chosen to buy. 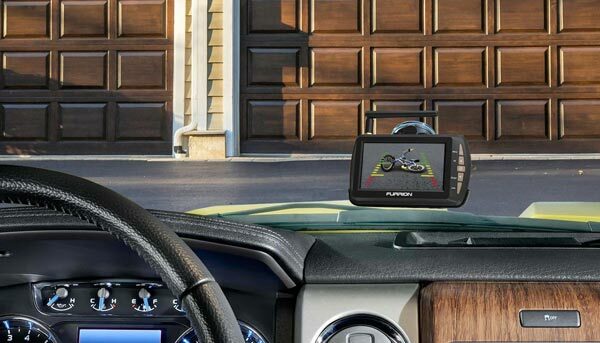 You can check out the mounting options part of the buying guide section of this article to give you an idea of the exact location where you should mount your chosen backup camera. Such will be determined by the surface mounted, the flush mounted, and the license mounted camera. How to install an RV backup camera? Installing an RV backup camera is actually something that you can do on your own. 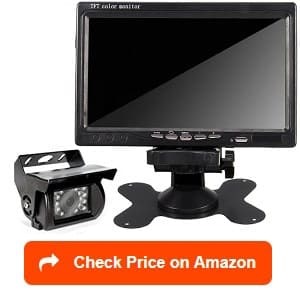 If you decide to install a wireless backup camera for 5th wheel and RV then the first thing you have to do is to look for a convenient spot where you can install the monitor. Use an alcohol in cleaning that part of the dash then apply the mounting option. The next step is plugging the monitor into a 12-volt socket. You should then connect the power cable of your camera into your RV’s backup light circuit. If necessary drill a hole especially if you need that in installing or mounting the camera. Take out one of the backup bulbs as well as its socket. The next thing to do is attaching the power cable of the camera into the colored circuit wire. Also, ensure that the camera’s black lead is connected to the black wire of the backup circuit. You should then replace the bulb and socket. Turn on the monitor and do some tests to figure out if you have done the installation correctly. How do wireless backup cameras work? A wireless backup camera works by employing a receiver and a wireless transmitter. If you are looking for a wireless backup camera for recreational vehicles, take note that you will also need to check out whether it has a night vision capability. It is mainly because such feature plays a major role in the quality of the produced images. If possible, ensure that the backup camera comes with infrared LEDs as such lights do not only indicated the quality of the camera but also help users ensure that they can see even when it is dark. A wireless backup camera without night vision will most likely cause you to depend on tail lights to find an image. Such lighting is insufficient when using backup cameras for recreational vehicles, so a night vision is really necessary. Also, make sure to check the wireless camera thoroughly to determine if there is an interference. Some wireless RV cameras are capable of transmitting signals at 2.5 GHz frequency. The one, which is commonly used, is known as the analog signal that is prone to interference in the same way as the digital signal. Some of the issues that might result in interference, causing the camera to be incapable of working as it should, are Wi-Fi networks, cordless home phones, security systems, and Bluetooth devices. If you get a camera with an analog signal then there is a great chance that you will be receiving images coming from other vehicles. If you want one, which is less prone to interference, then consider getting a camera that uses a digital signal. Choosing the best RV backup camera from your numerous options is not that easy as there are several factors and features you have to take into account. If you face confusion during the selection process, feel free to check out legitimate reviews of various backup cameras such as this article. You can use all the details in this article to figure out which one among your choices can guarantee safe and convenient driving. We would like to thank you for reading this article. Find out more about how to choose the best wifi boosters for RV, best RV GPS and best RV tire pressure monitoring systems 2019 with our reviews and ratings. Furthermore, please take a look at the best cell phone boosters for RV, best TV antenna for RV and best TV for RV to choose the right one for your RV electronics.